The spiral stair pictured here is rugged. It has a 5’ diameter, 18’ floor-to-floor and freestanding. This spiral staircase has serrated bar grate steps and landing for superior foot traction. The 6” center column gives strength to reach up 18’ without bracing exceeding wind loads. 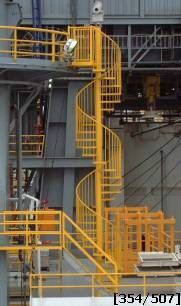 If you are considering replacing cage ladders, spiral stairs by Stairways, Inc. can be your solution. OSHA does not require that a safety harness be used while walking up a spiral stair. The spiral stair shown here shipped in one section and the welded construction made handling virtually effortless. A crane’s straps are attached to the spiral stair under the top step then the stair is lifted into place. Welded or bolted, the stair is connected at the top through the landing and at the bottom through the center column base plate. Time is money and a spiral stair from Stairways, Inc. would be well worth the effort from design to installation.